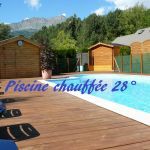 Located 300 metres from Chorges (all shops), only 3 km from the Lake of Serre-Ponçon (bathing, windsurfing...), camping Prevaliere offers spacious and shady locations. On-site, poss. vacation cabins all equipped (per night or week). Playground, trampoline, common room (space games and relaxation). Heated swimming pool from 15 June to 15 September. Wi - Free Fi. Many biking and hiking trails. walking from the campsite. Summer, gd market on Sun. morning and night market of craftsmen on Wednesday evening. All shops and services in the village. May, June, seven promotions and > 7 nights stays: see prop.